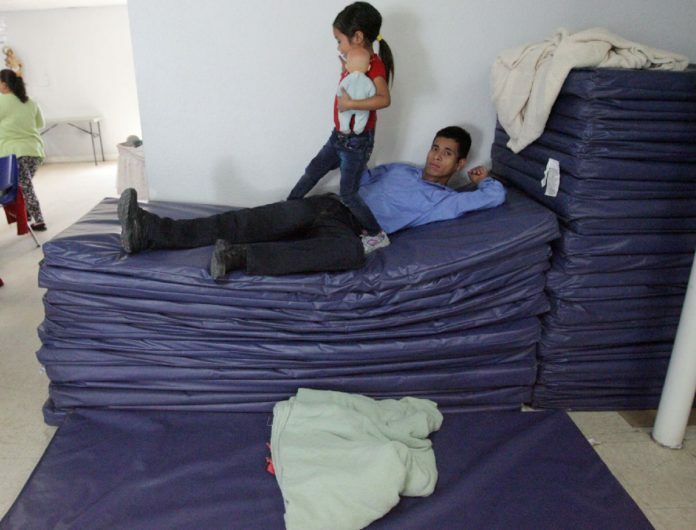 A Guatemalan father and his daughter rest on blue mats at the Humanitarian Respite Center Thursday April 12, 2018, in McAllen. McALLEN — Next to the worn bar of soap on the floor of the cramped shower stall lay an empty Department of Homeland Security-issued plastic bag the size of a rectangular tissue box. “G-77” was sharpied on the side, which meant an immigrant had left it behind. A half-empty bottle of bright blue mouthwash sat on a sink nearby. So did two plastic, disposable razor blade guards. Volunteers argued earlier this week that they needed more of those at the new, temporary Catholic Charities-operated Humanitarian Respite Center downtown. This bathroom — which can’t shed the smell of damp, used towels — is one of four at the new center that has seen a slight uptick in visitors recently. The increase, however, is still minimal compared to 2014, said Sister Norma Pimentel, director of Catholic Charities of the Rio Grande Valley. There’s just one shower for males and one for females, as opposed to the previous respite center at Sacred Heart Catholic Church, which had plenty of shower stalls and helped feed, clothe and bathe more than 60,000 immigrants since 2014, when hundreds would pass through the church daily. Francisco Osmin Campos Colato, a 27-year-old from El Salvador, said last week he didn’t get to shower during his several-hour stay at the center. “It was occupied,” he said before smiling and lifting each arm to take a whiff. A lack of bathing options isn’t the only difference between the new respite center and the old site just blocks away. Despite the smaller space, no one told Pimentel to move from the church, she said. They moved in the fall of 2017 when their visitor numbers were down, she said. The current location is on Beaumont Avenue between Bicentennial Boulevard and 17th Street and in the shadow of the federal court building, Bentsen Tower. The numbers slightly spiked recently, after nearly a year of minimal visitors. More than 7,000 immigrants passed through the center in both November and December of 2016, after President Donald Trump won the election but before he took office. Following the president’s inauguration, Pimentel witnessed only a couple hundred immigrants a month for several months. In December 2017, the numbers climbed back up to nearly 3,000 immigrants passing through. This fell to 1,788 in January, and then to 1,530 in February. Numbers for March haven’t been released yet, but the center was busier at the end of that month and during the beginning of April. This last week, center volunteers and McAllen bus station workers said it had been quieter — about 30 to 50 people per day, Pimentel said. The bus station, just a few blocks from the current center, is where the immigrants board buses to meet up with their families elsewhere as they await their asylum hearings. While the current quarters aren’t ideal, Pimentel is glad the center is close to the bus station. The building they’re using belongs to the family of Hidalgo County Sheriff Eddie Guerra, who Pimentel said she pays rent to. Pimentel plans to keep using this building for about two more years while she awaits the construction of a permanent center across from Sacred Heart. That new center will likely be several floors tall, and Georgetown University officials are helping with the planning and fundraising, Pimentel said. That building will likely cost in the $6 million to $8 million range, she added. On April 30, Catholic Charities and Georgetown University will launch a nationwide competition for the architectural designing of the new building. They will select eight finalists in the summer, Pimentel said. But for now, the immigrants will continue using the building on Beaumont Avenue. Immigrants receive soup as they did at Sacred Heart, but it’s different at the new center. The Salvation Army brought food to Sacred Heart, Pimentel said, but they don’t provide to the new center. Edin Nahun Lopez, a 23-year-old from Honduras, said he and his 6-year-old enjoyed the chicken vegetable soup. Volunteers said soup is helpful after a malnourished trek from Central America. Clothing bins are stacked in a hallway, as well as in a closet. At Sacred Heart, though, clothing racks were spread across the back of the converted parish hall, giving immigrants an abundance of choices, as if they were in a thrift store. A distinct difference is also a lack of sleeping options. At Sacred Heart, air conditioned tents were pitched in the back parking lot. Immigrants are often tired after their grueling journey, volunteers said. The tents gave them a much-needed reprieve. But the new center has no tents. And immigrants often have hours, sometimes the better part of a day, until they’re steered to the bus station for their departure. One young girl took a blue gym mat to the corner. A group of young children tossed a styrofoam football back and forth. Others ran around a play area nearby. But the young girl with the mat was tired. She didn’t bother to remove her Nike sneakers, her blue jeans, her T-shirt or her pink and black jacket. She laid down and slowly fell asleep. There were no pillows, so she had folded the end of the mat to make one of her own.